HIX VS series dryers are for screen printers who are just starting up or are on a tight budget. These dryers are built with the HIX standard for quality and reliability and provide all of the basic needs to cure plastisol inks. These dryers are not recommended for high moisture/water-based inks. The HIX Magnum and HIX Premier models are better suited for these applications. 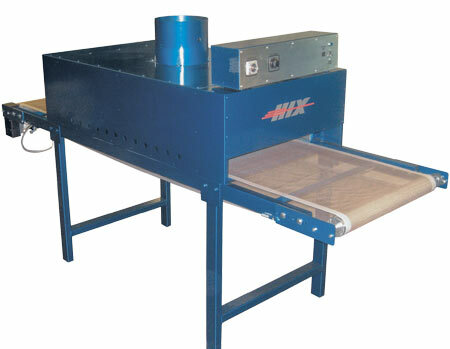 HIX Pioneer dryers incorporate a infra-red and infra-air drying/curing system. HIX Pioneer Dryer Features Include: * High performance, long lasting infra-red heat panels built by HIX * Circulating single speed air system (air not included on VS-2408) * Belt speed and heat controls * Fiberglass belt. Width: 31 ¼", Length: 38 ¾"